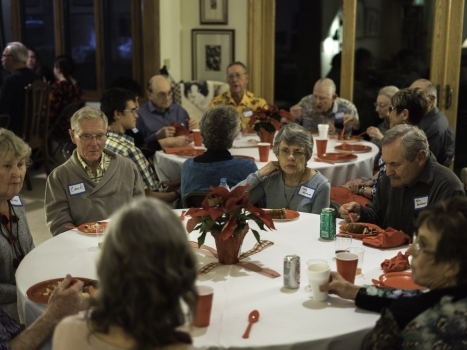 Our January 28th meeting filled our available space in Levi Mize’s shop with 42 members and guests. Ten new members joined and after last year’s members who plan to rejoin pay their dues of $25 we will likely be back up in the 50+ member range again. In the absence of our president and vice-president your editor was pressed into duty to run the meeting. Al Geller announced that the Cabrillo Middle School Mentoring program was going well but he can always use additional people to sign up to cover specific dates and act as backups in case someone isn’t able to attend. He has sent the schedule out to those who are participating. See the officers page to contact him. 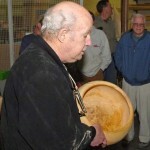 Jim Rinde has entered the Club’s trebuchet from the AAW 2003 club challenge in the Edward-Dean Museum woodturning show. It is for sale and non-members can contact him via email to the Editor. 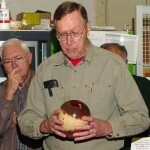 Jim also mentioned the California Contours 2006 Woodturning Exhibit in San Luis Obispo from May to June 2006. Several members may carpool up in June (?) as a group for a weekend and take in the farmers market on a Sunday. 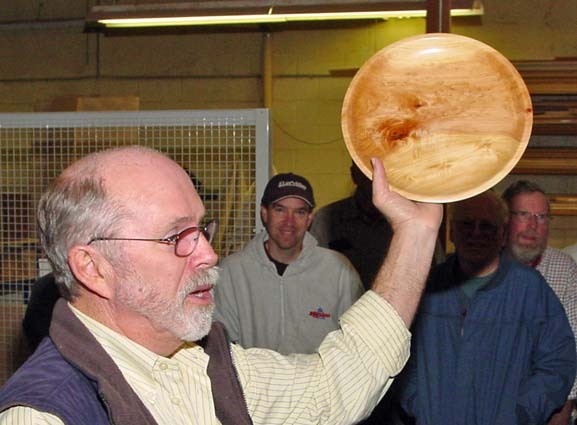 Program Chair Joel Oksner announced that Stuart Batty would be demonstrating on August 26th. Check out the Schedule page. His topic will be the use of the negative rake scarper. 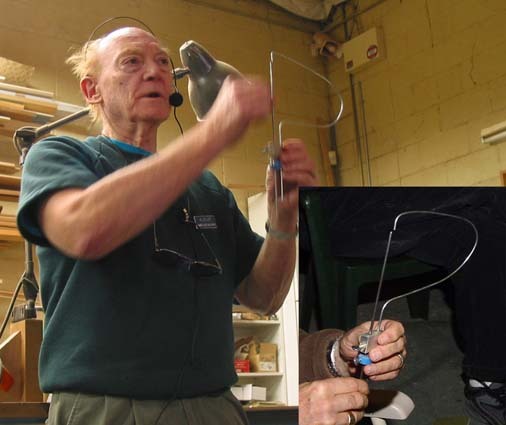 Note that the photos have finally been added to the J. Paul Fennell Demo on two pages. Eventually the Chris Stott demo will get posted. Your editor is looking for writers to help describe each meeting and demonstration to go along with the multitude of photos that we take and need to choose from. Volunteers gladly accepted or you will be asked! 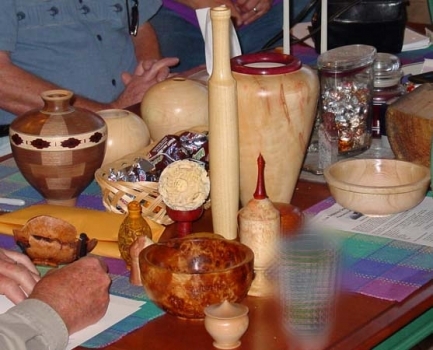 The next meeting is another of our favorite hands-on workshops at Russ’s home. 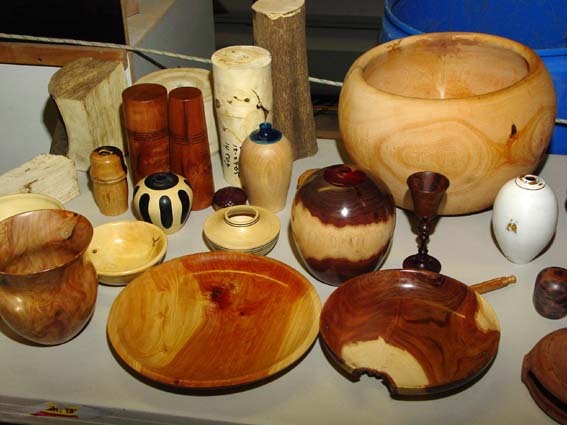 We will have at least 4 lathes, sharpening equipment, and lots of tools for non-turners and beginners to practice on under the guidance of experienced mentors. Bring your safety gear (face mask) and tools that you need help sharpening. 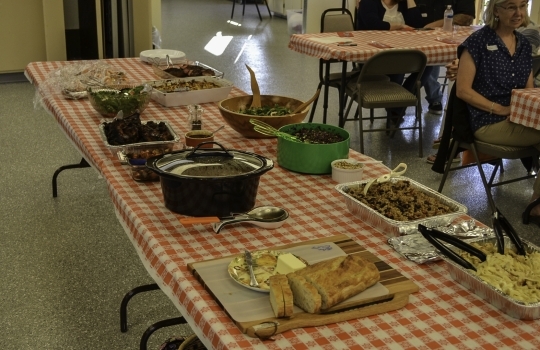 Lunch will be served for a small donation and we will continue into the afternoon until everyone is tired. January’s program was a great start to the year with a superb Show-N-Tell session followed by a discussion of tool making by two of our members. 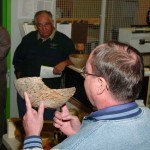 Ira Goldberg provided the write-up and Ron and David took the photos. Herm and Al talked about making woodturning tools using two different approaches. 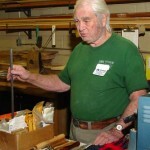 Herm described making tools from steel stock and wood, and Al described modifying inexpensive tools for infrequent use. Making tools from steel and wood. 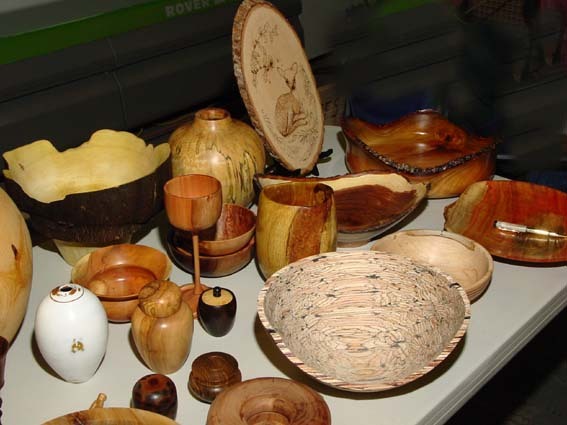 Most woodturners have the skills and equipment to make scrapers and skews by grinding High Speed Steel (HSS) into the desired shape from the tool stock, then attaching a handle, either home-made or purchased. HSS has the advantage that it is nearly impossible to overheat the metal in our shops. Round rod is available as HSS “drill blanks”, and square and rectangular bars are available as “tool stock.” They can be purchased in a wide range of dimensions, but the lengths are limited to typically 4″ to 6″ from source 2 (below). 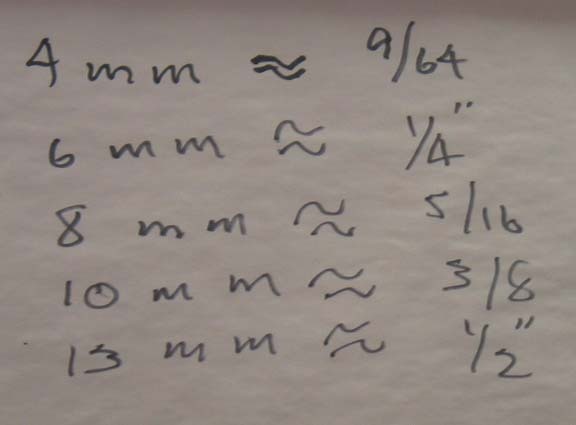 Longer lengths are more easily available in metric sizes from source 3 (see common conversions Herm uses in the photos). Since HSS is difficult to cut, it is best to get the length closest to the one you need. 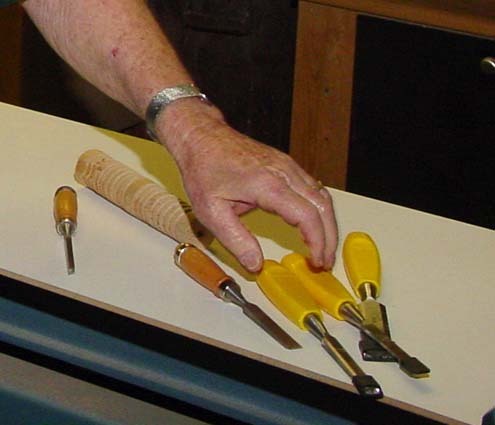 Cutting, if needed, could be done with a Dremel Tool with the proper attachment. Short stock is best for thin tools to minimize flexing, while longer stock of greater thickness should be used for larger tools. Old planer blades of HSS make great flat blanks for scrapers. Carbide steel stock is expensive, doesn’t take as sharp an edge and requires expensive “green” wheels to grind. HSS such as M2 or a slightly more expensive type labeled “cobalt” is ideal for woodturning. 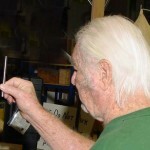 Shaping could be done with a grinder or Dremel (or Foredom) tool, depending on the contour you need. 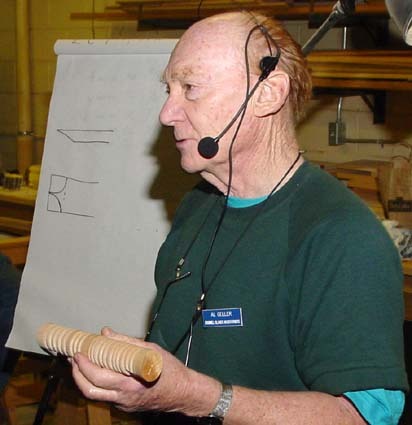 The grinding wheel material is not critical, but Herm recommended 60-grit wheels. 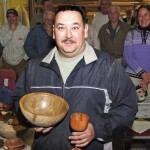 He uses regular gray wheels which he mounts on the outboard side of his lathe. Coarse wheels cut quickly, and fine wheels cut more slowly but give a finer finish. White (or pink or blue) wheels (Aluminum Oxide) don’t clog as fast but lose their flat surface as new sharp particles are exposed and need to be dressed frequently. 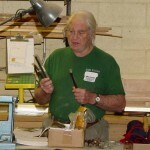 Gouges are more difficult to make because they require making flutes in round HSS stock, which requires special machining equipment. An X-Y vise on a metal lathe or drill press with a small carbide bit will work if done slowly. Heat Treating: Generally the same procedures as above are used, with the additional step of hardening the steel. 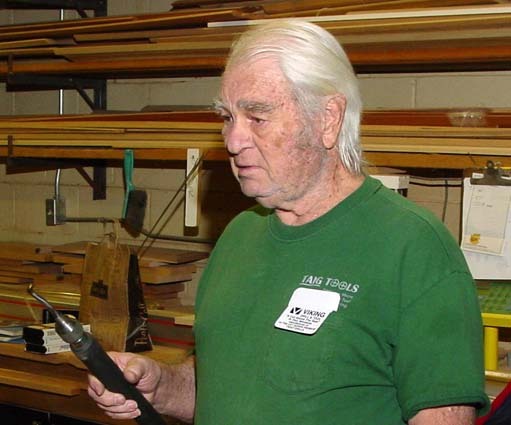 Many more stock shapes and lengths are available in unhardened steel, which can be cut fairly easily (oil-hardening is softer than water-hardening and can be cut with a file or hacksaw). There are three types of “soft = tough” steel: Air-, Water-, and Oil-Hardening. Air-hardening isNOT suitable for homemade tools as the hardening and tempering require special equipment. Water- and Oil-Hardening steel require heating in an air- or oxygen-acetylene flame until the steel is past cheery-red hot (while the metal is that hot it can be bent into different desired shapes prior to quenching), then immersing it into the oil or water. At that point the steel is glass hard and very brittle. The steel must then be tempered to reduce the brittleness and restore some toughness by heating in a cooler flame to a blue color. Alternatively this can be done in a kitchen oven set at 550° for about 1/2 hour. After cooling slowly at room temperature the tool can be sharpened and polished on the usual grinding wheels but should not be quenched in water but allowed to cool slowly to avoid loss of the tempering and return of a brittle state. 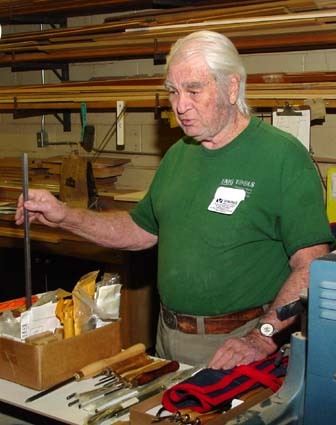 Help is Available: Herm said that he would he glad to help any club members who are interested in making their own tools. 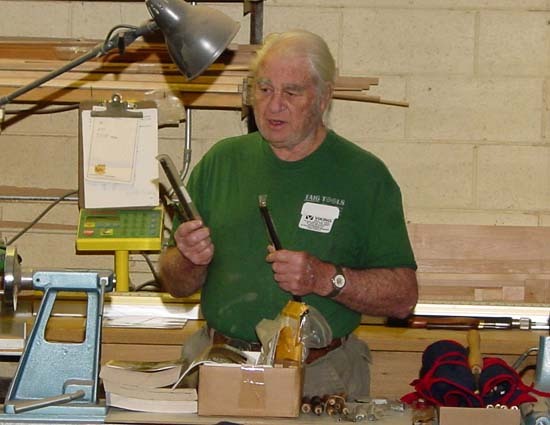 Modifying Tools: Al Geller, claiming “Laziness” described modifying tools. 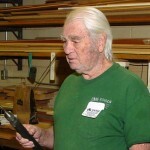 He purchased some “yellow-handled” chisels and woodcarving tools at Harbor Freight, and ground various scrapers (mostly beading tools) from the chisels. He grinds away part of the cutting edge of the original tool to make the heftier edge needed for scraping except for the sharp point of the beading tool. Then he grinds the scraper shape that he desires similar to commercially available square- and round-edge scrapers and beading tools. 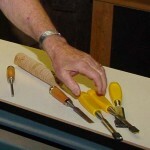 The chisels seemed to hold up better than the carving tools. While these tools require more frequent sharpening than high-quality turning tools, you can’t beat the dollar-and-a half per tool cost. 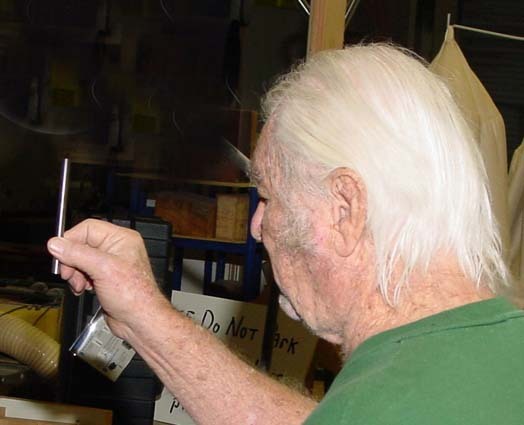 He also showed a thickness-caliber that he made from 1/8″ aluminum rod, a small (about 1″ x ½” x 1½”) aluminum block, a plastic or aluminum disk, and three thumbscrews. 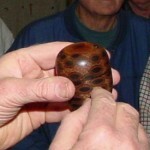 This is the same design as used by J. Paul Fennell. 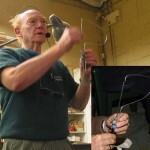 The shape of the bent wire can be modified or interchanged with various pre-made shapes to accommodate different configurations of hollow vessels. 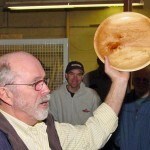 Mike with a large Sycamore bowl turned end-grain while semi-wet and allowed to dry. 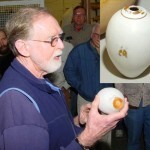 Sam with the hollow-form he turned durning his November 2005 demo. 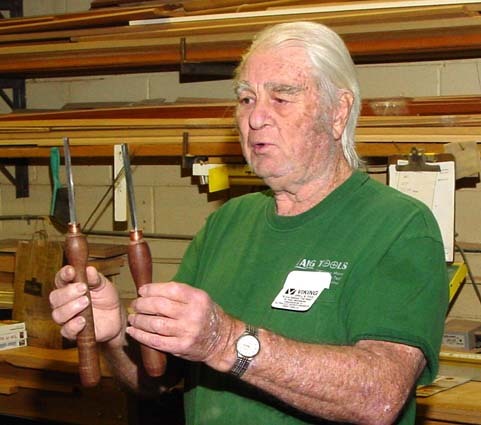 As the wood dried it began to show cracks so he drilled a hole in the bottom to relieve the tension and later plugged it. 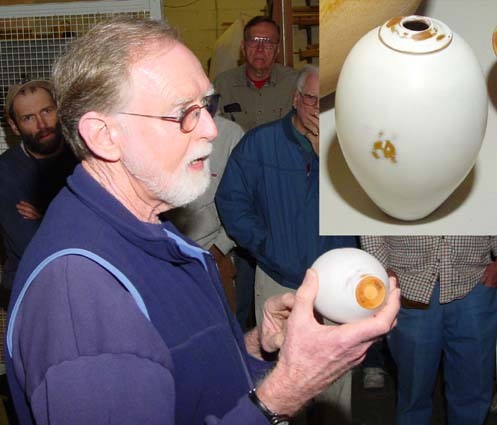 He applied milk paint as a finish with a mustard-colored under coat topped by white. 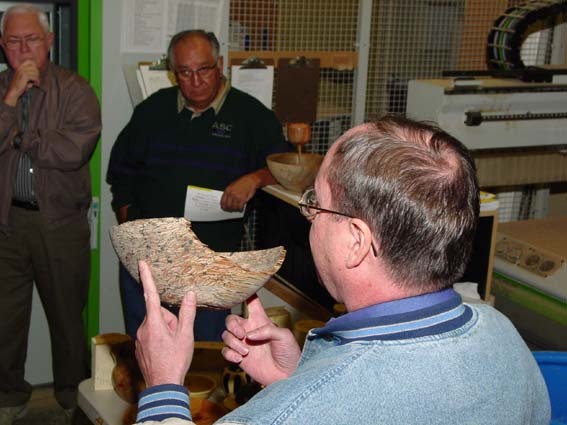 See the December 2005 newsletter. 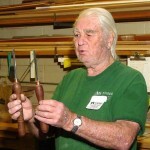 Ron holding a box made from a Banksia Pod. 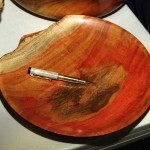 He cleaned the fuzz and filled the natural pores with black epoxy. 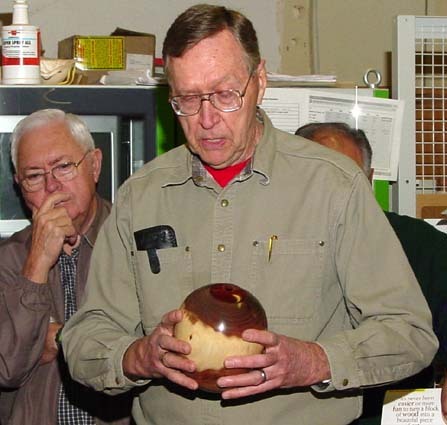 Russ holding a ParaLam Wood vessel that exploded while he was turning it. 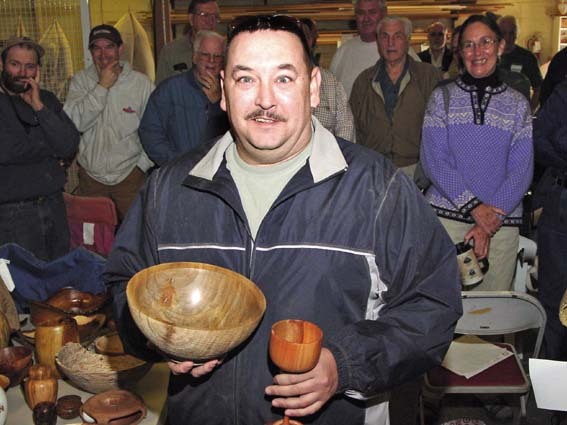 He has successfully made several endgrain hollow-form vessels form this material but its cross grain strenth is weak for bowls. 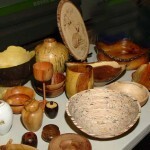 Show-N-Table view 1. 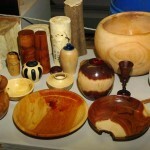 The blocks of orange tree wood on the far left have been microwaved dry by Jim. 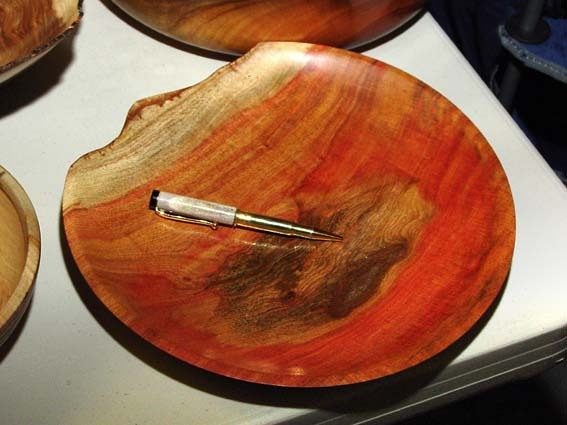 He finds this a rapid way to prepare wood with minimal checking. Show-N-Tell table view 2. 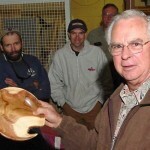 Mike Lindsay turned the natural edged end-grained vessel from Orange tree wood shortly after it had been felled. 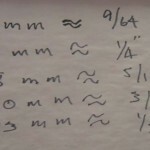 The rough metric to SAE conversions that Herm uses. It is easier to buy the metric sizes in longer lengths. 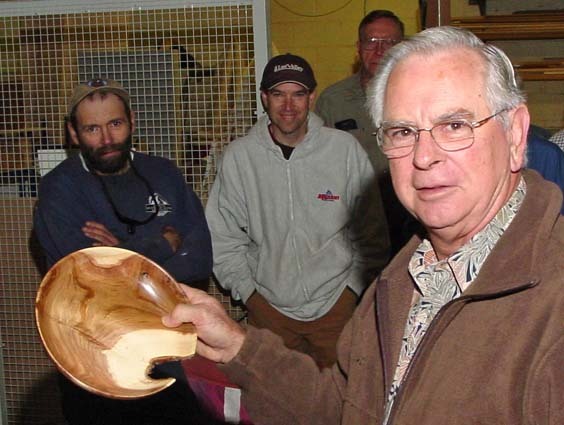 Al holding the thickness-caliber he made. 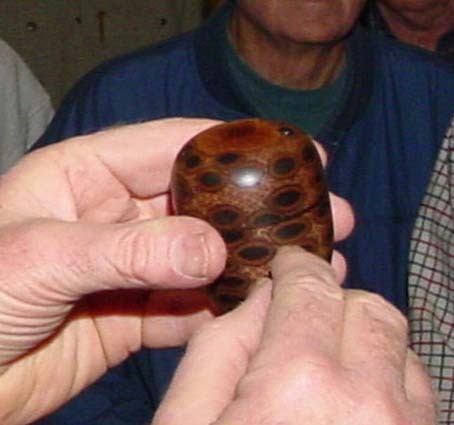 Inset shows the blue disk which is set with the ends of the wire touching. The gap between the disk and the block is the wall thickness. Different bent wires can be interchanged. See the J Paul Fennel Demo pages for details. A set of 4 “HSS” steel chisels for $7 which Al grinds to single and double points as beading tools. The tool is pushed straight into the wood to establish the contour then pulled out and wiggled side to side as a scraper to smooth the bead. A double pointed grind allows registration with the previous groove to make a series of evenly spaced beads. 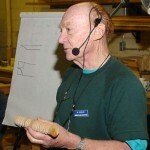 Al trying out the clubs new microphone system and holding a sample of the bead work. 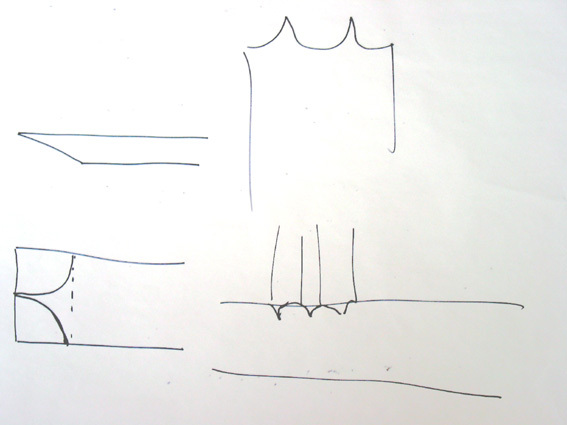 The shape of the ground chisel is drawn on the paper. This type of tool works best with hard woods. 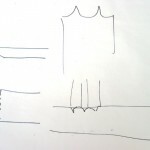 See the next photo for second drawing of double pointed beading tool.